As TS Blue Clipper heads for St Maarten / St Martin, here are some interesting sea turtle facts…. 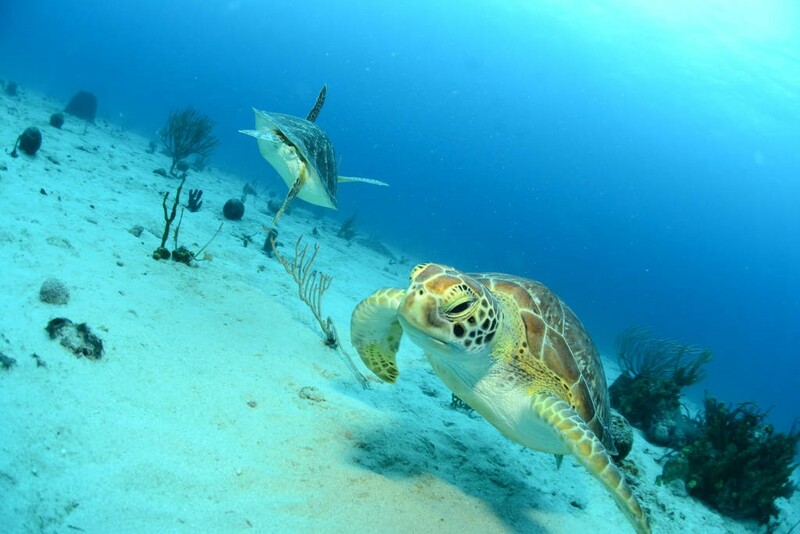 There is a healthy turtle population living around the island of St. Maarten / St-Martin and there are four different species that can be spotted in our waters. All species of Sea Turtles spend their lives in the ocean feeding, swimming and sleeping beneath the waves. The only time they venture onto shore is to lay their eggs. Females travel thousands of miles back to the beach they hatched from to make their own nests. They come onto shore at night and dig out the nest cavity with their back fins, lay their eggs inside and then pack sand back on top of the eggs to protect them. On average 90% of these eggs will hatch successfully but only 1% will live to sexual maturity. There are several obstacles for hatchling’s to overcome including, predators, harsh water conditions during storms and human impact on the ecosystem. Baby turtles hatch together so they can storm the beach as a group, increasing their chance for survival. Most often they emerge at night using the moonlight to guide them to the water. Beach side buildings with powerful lights can confuse new born turtles into heading inland rather than out to sea. So turn off outdoor lights that point toward the ocean in the evenings! Nearly every species of Sea Turtle is listed as endangered by the International Union for Conservation of Nature. Greens are currently listed as endangered, Hawksbill’s as critically endangered and Leatherback’s and Loggerhead’s as vulnerable. There are several reasons for this. Sea Turtles face a huge variety of obstacles in reaching adulthood. Along with the risk of being hunted by marine life and humans for their meat or shells, turtles are often the product of bycatch while humans fish for tuna or swordfish. In addition, more and more turtles are being entrapped each day by human debris in the ocean. As they get entangled in old fishing nets or plastic pollution it weighs them down, causing increased stress and eventually keeps them from reaching the surface to breath. -Refuse single use plastics- Plastic bags look very similar to jellyfish underwater and are often ingested by unsuspecting turtles. -Don’t eat fish that were caught using long line fishing- this method leaves hooks in the water for hours and often has a huge amount of bycatch; including Turtles, Dolphins, and other endangered animals. -Don’t drive on the beach- This is illegal in St. Maarten, and you can easily drive over a nest without knowing and crush all the eggs inside.